Long and lean, the extended direct-vent makes a dramatic statement—high-impact, while still sophisticated in design. A fixed ceramic glass window complements its sleek dimensions. This is the ultimate choice for a large, open space. 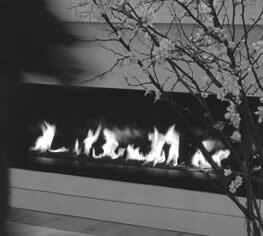 The linear effect of this fire creates a stunning focal point for any gathering place, whether in the home or a commercial environment. Place this fire anywhere it can vent to the outside, through a roof or an exterior wall. No need for either a chimney or hearth. This is an extremely efficient fire. Air is drawn from outside, ensuring no draft and no heat loss. In fact, this fireplace operates at an impressive efficiency rate of near 80 percent.